A student veterinary nurse said she is too scared to return to her favourite spot after a vandal damaged her car. Police said they are no longer investigating the incident on May 17, sparking Chloe Boarer to appeal for witnesses to come forward. The 23-year-old parked in Swillage Lane in Angmering to take her dogs Pip, 13, and Bella, three, for a walk in the Angmering Park Estate, moving some concrete blocks and logs blocking the layby to park in her usual spot. But when she returned half an hour later at 8.30am, the blocks and logs had been moved back, denting her weeks-old car and causing £350 of damage. 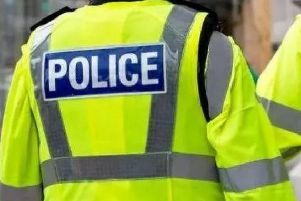 Later that morning, the apprentice at the Fitzalan House Veterinary Group in Fitzalan Road, Littlehampton, reported the incident to police online, but they closed the case due to a lack of witnesses. The Dapper’s Lane resident urged potential witnesses at the stables and campsites nearby to contact police.